The museum’s Clore Learning Space provided a convivial and inspiring setting for the London premiere. Part of the museum's recent redevelopment project, this bright and modern room is decorated with a display of trailing Tradescantia plants in honour of naturalist, gardener, collector and traveller John Trasdescant. The learning space overlooks the Sackler Garden, the centrepiece of which is Tradescant’s magnificent and enigmatic tomb. The garden was designed by renowned Garden and Landscape Designer Dan Pearson to reflect Tradescant’s life and spirit and is filled with unusual and sculptural botanic treasures. 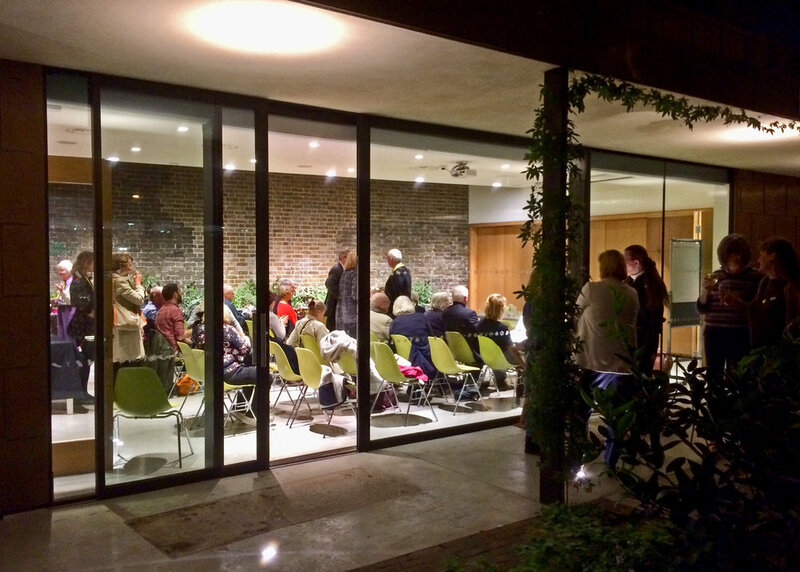 After an opportunity to meet Turn End Trustees and staff, speakers and fellow guests over a welcome drink, the event was introduced by Landscape Architect Dominic Cole, former Turn End Trustee and currently one of our garden advisors. In recognition of his long standing support of the Turn End Trust Dominic was recently invited to become one of our Patrons. Dominic read a letter of support from Architect Richard Murphy, another Patron of the Turn End Trust. Richard helped to instigate the documentary project and interviews Peter in the film about Turn End’s creation and design. “I am so sorry not to be able to be with you tonight but I hope this message communicates the importance of what I think Murray, Hamid, Carol, Peter and Margaret have achieved. It is always gratifying to bring creative people together and wait and see what happens; or to use a seasonal analogy, to light the blue touch paper and then retire! In this instance Peter Aldington and Murray Grigor are also both very good and longstanding friends who's respective work needs no introduction. Architects and film-makers have remarkably similar lives; each are relatively financially insecure living from job to job, each needs to bring considerable number of other people along to make the enterprise happen, and each spends quite a lot of someone else's money without which the creative idea would never see the light of the day! But at least films don't leak! Photographs and plans and the printed word are the usual way of explaining architecture but film takes us to a completely different level where I believe many more can both experience what it is like to be there and then go on to understand the significance of what has been created. Murray's film I believe is long overdue but I believe it is a brilliant record of what Peter and Margaret Aldington have achieved over 50 years, puts it all in context and explains its significance but also shows the sheer beauty of the architecture and the landscape particularly as both change with light and through the seasons. Following the screening, Dominic invited the audience to question the panel of speakers - Margaret and Peter Aldington; Elain Harwood of Historic England, an expert on 20th Century architecture who is currently researching landscapes of this period; Murray Grigor, the film’s producer and director, who has made more than 50 documentaries exploring art and architecture; and Jackie Hunt, Turn End’s gardener. The audience was keen to hear the panel’s comments on why British housing development still fails to learn from the Turn End model, Peter's inspirations for the project, practical aspects of how the Aldingtons created and maintain Turn End, and how the garden is evolving more than 50 years on from its creation. The museum was buzzing as the Nave gallery space was also the venue for a talk by Dan Pearson on some of his horticultural projects in London. 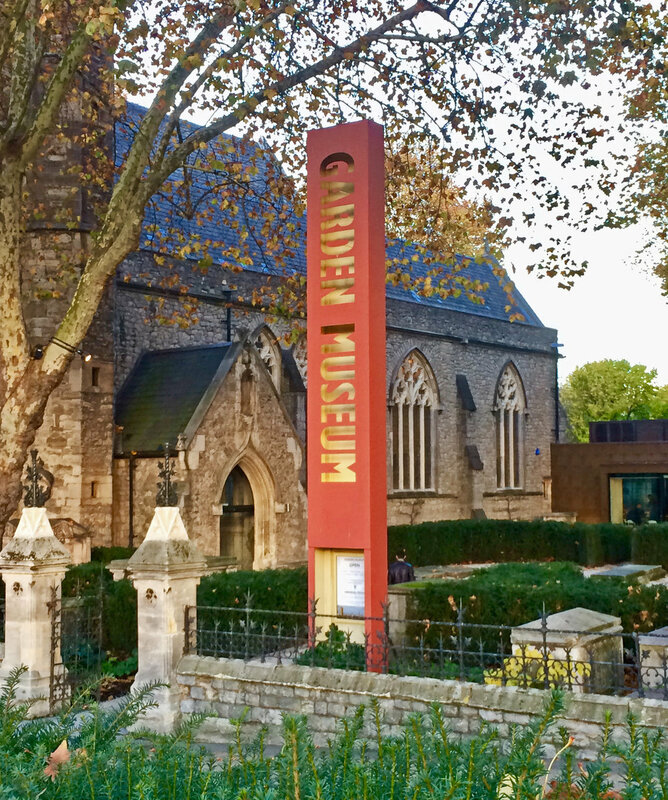 Thank you to all the staff at the Garden Museum for hosting a fantastic evening in a glorious setting and special thanks Turn End Trustee Karen Fitzsimon for masterminding the event. Would you like to see the Turn End film? We hope to run more public screenings, so keep an eye on our What’s On page or join our mailing list to receive notifications of forthcoming events. You can also purchase a DVD for viewing at home from our SHOP.